Everyone in the world is a speaker of their own language. Because of this, everyone can teach someone else how to speak their own native tongue. Who better to teach others than someone who already knows a language very well? 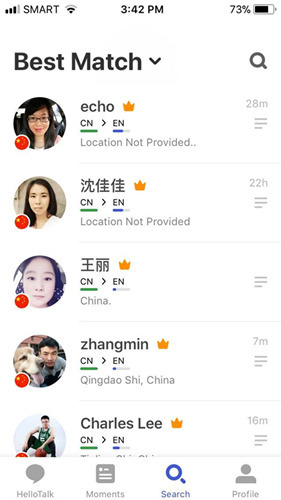 This is the foundation for how HelloTalk works. 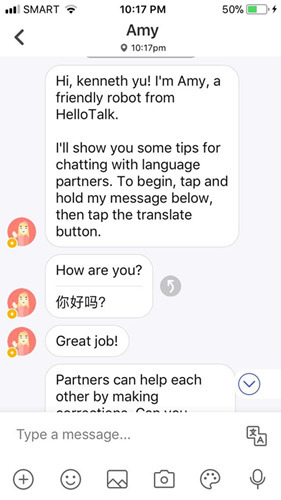 HelloTalk is a language learning app (for both iOS and Android) that connects people who want to learn a second language to those who know it as their first. They make this connection by setting up familiar social-media communication tools such as private chats, public chat groups, search, video, and audio recordings in an integrated app. What’s more, HelloTalk also provides translations and transliterations to help learners understand each other. 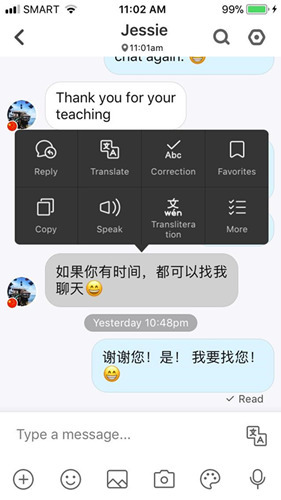 Because of this set up, the best way that HelloTalk works is when two students who want to learn each other’s native language try to teach each other. 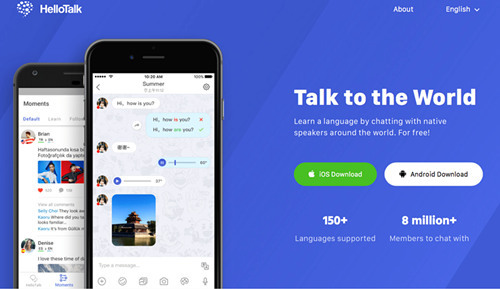 The app claims to have millions of members from all over the globe with over 100 languages to be learned. 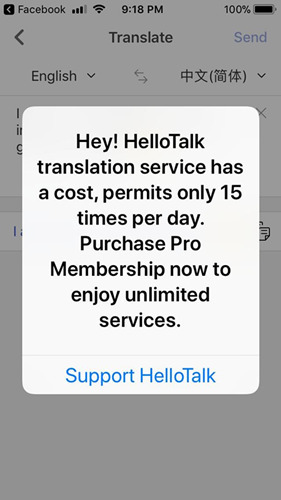 As with most apps, it is easy enough to find HelloTalk on Apple’s App Store or on Google’s Play Store. Downloading it is quick, and registration is simple and easy. All it takes is to enter your name, birthday, and first language via the app (as well as the language you wish to learn), which you will then have to verify through an email. It took me less than five minutes to complete this process. After registration, you will be shown a brief greeting page, and from there, proceed to the main HelloTalk page where you can see all the four main features. These four main features are: HelloTalk, Moments, Search, and Profile. 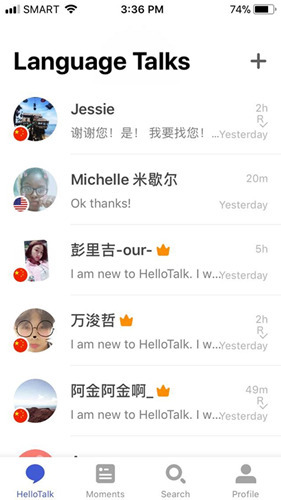 HelloTalk is the private messages page which lists and shows all those you have sent messages to. These are your fellow learners, the ones who are going to teach you the language you’ve chosen to study, and whom you will be teaching your own native tongue. Moments is the group chatroom. 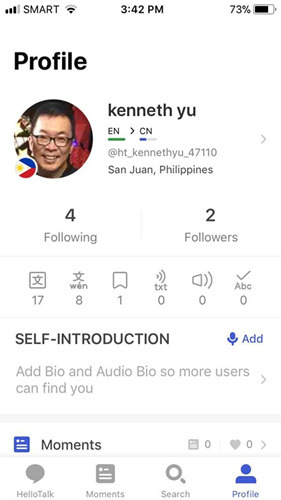 This is where you can publicly talk to all the native speakers of a language who are members of HelloTalk all at once. It functions like a regular chatroom, as any subject matter can be talked about. You can ask questions about language, culture, or even travel. Moments is interesting because at the top part of the screen, you can choose to see the conversations under Default, which is most everyone in the language community you are in talking about any topic; Following, which are those particular members you have chosen to follow; Learn, which are posts related directly to learning the language; and Classmates, which are those members studying the same language you are interested in. Search is just what it says it is, a tool that helps you search for the ideal partner with whom you can learn and chat with. HelloTalk does its best to match you to other members who can best help you and who you can also help. While Profile is simply the information page about yourself. The flag of your country will be shown in the profile picture, and you can give a short biography about yourself. For me, getting used to the interface took some time. Once I had finished registering, it was not quickly evident to me what each part was for. I was grateful for Amy, the chatbot that helped me understand how exactly to use the app. I advise spending time with Amy. She will teach you how to use the app properly. 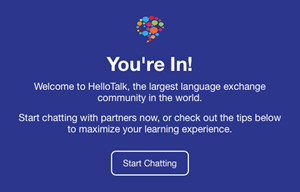 You can learn about how to make corrections, use audio and video, send images, and most importantly, how to find chat partners, which is what HelloTalk is all about. Overall, it took me about 10-15 minutes of chatting with Amy before I was confident enough to try to explore the rest of the app. And that is where I encountered a bit more difficulty. I used the Search function and scrolled through the list to look for some chat partners. It was hard for me to choose, even if I knew everyone there was willing to teach Mandarin, and was looking for an English speaker like me to learn from. In the end, I messaged a number of other members hoping someone would answer back. In the end, a very nice lady from Shenzhen named Jessie, messaged me back. You should put in time and effort to find a good partner to chat with. Once you do find one, everything becomes great! Jessie was a wonderful partner. She is such a nice lady and very patient in teaching me proper Mandarin, and I did my best to teach her English. This is where HelloTalk really lived up to its promise. Once two people come together who are willing to learn and are patient with each other, learning a new language becomes very interesting and fun. Even if both Jessie and I were very slow, she with English and me with Mandarin, we could understand each other and were correcting each other as we learned. Because this was happening with a real person who spoke Mandarin very well, I was learning very deeply about proper pronunciation and vocabulary. I was also doing my best to teach Jessie good English grammar, in the same way she was teaching me how to properly pronounce words in Mandarin. The above screenshot was where we were saying goodbye to each other after a chat. We not only chatted with each other, but we also shared audio messages, taking turns to send each other voice clips of what we were saying. This was slow, and we were not speaking to each other as if we were on a telephone or on videochat, but, this was actually good, because it gave us time to think and prepare what we wanted to say. This was actually perfect for early learners like us. We had time to study what we said to each other and to think about what we could say next. The above screenshot also shows some “in-app” features of HelloTalk, all of which are very useful. Most of them are self-explanatory, but the most useful ones for me are Translate and Transliteration. Translate allows me to read in English what Jessie typed in Chinese in case I didn’t understand it. Transliteration shows me the pinyin, helping me pronounce what I was reading. Very useful! Once the 15 free times translation are used, it allows us to upgrade to Pro Membership so that we can enjoy the unlimited services. Or we can also go outside of HelloTalk and use another translation program to try to understand things others said that were not clear. HelloTalk allows us to report bad behavior that we see. Also, many HelloTalk members were quick to write comments and say that this bad person should be reported and then ignored. I’m glad that there are many good members on HelloTalk. 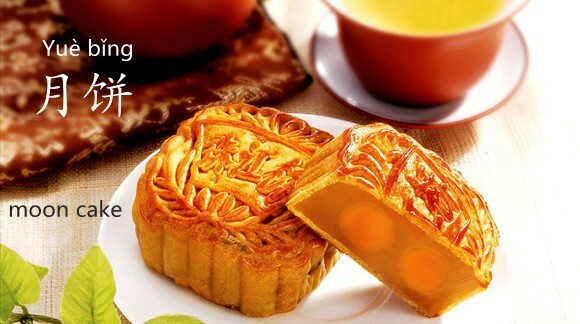 For HelloTalk, everything depends on finding a good chat partner or partners. But once you do find one, learning becomes enjoyable and fun. I like Jessie very much. She was very patient in teaching me, and I hope I was able to teach her also. Jessie was so nice, I plan to chat with her again next week, and every week after that as often as I can because I know that this will help me improve, and at the same time, I want to help her become good in English also. Unless you are already an intermediate student, I also advise you to get the VIP membership. It was so hard to use the app in free mode once all the translation services were used up. 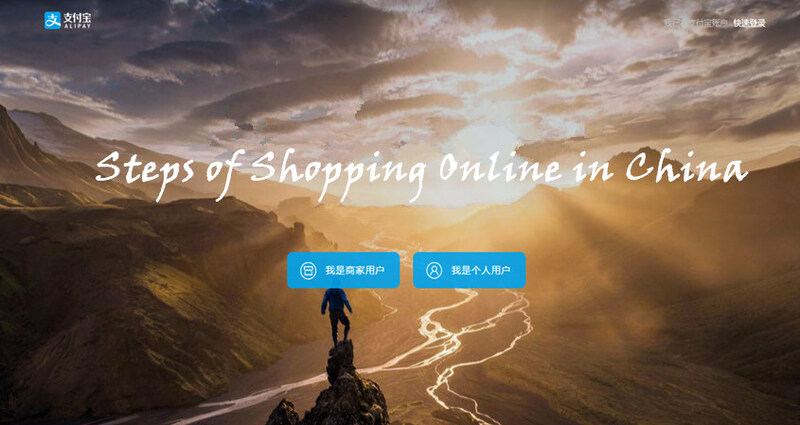 In addition to unlimited translation services, you will also get Power Search, no ads, exclusive use of stickers and cards, and you can learn up to three languages at once. You’ll have to pay for this, though. HelloTalk is a very good app for learning from other native speakers around the world. It may take some time to get used to its user interface, but once you do, it becomes quite convenient. 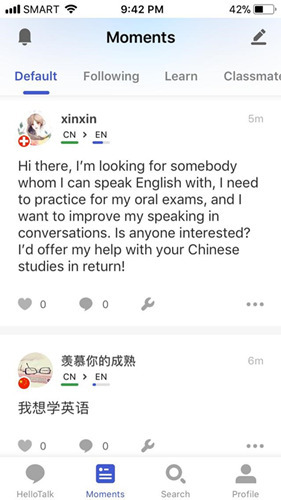 What’s important with HelloTalk is finding the right chat partner! It is here where you must invest some time in finding a good partner with whom to learn each other’s language. But once you find a good partner, learning becomes better. Though your partner may not be a professional teacher who knows all the proper grammar rules, you will learn exactly the way a native speaker uses the language, which is always the best form of practice. All our teachers in the classrooms say that “practice makes perfect” when it comes to using a language, and that we should do this with other good language speakers. Therefore, HelloTalk is an app that will make sure you get to practice a lot!